Real Life English is finding that Pronunciation for Brazilians is a very important topic for our readers and for the Real Life English Community. 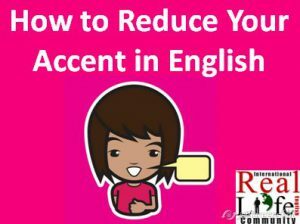 So, today we’re going to discuss, in a general but very important way, how to reinvent your English accent. Challenge you to reevaluate your beliefs and assumptions about pronunciation. Show you a few resources and strategies to improve yours (in English, or whatever language you are learning). Motivate/ inspire you to assume responsibility, take action, and plan the reinvention of your accent. In the next few weeks, I’m going to write an article on “10 exercises to reduce your accent.” Sign up for our newsletter (below), and so we can let you know when we publish it. If you liked this article, feel free to “like,” comment and/or share. And we really love people who spread the word about the Real Life English project to their friends! Take care. What strategies and exercises have been the effective for you learning correct pronunciation? What are your main problems with pronunciation? If you have any questions or concerns, we’re at your service. I really enjoyed your practical advice and links to great resources about accent reduction. I have some friends and students who are interested in this topic who I will be sending this way. Totally agree: moving forward in reducing accent is all about deciding to, doing it, and being consistent about it. And best of all, you can do it for free. Love your ideas! Thanks for the response and the enthusiasm for improving pronunciation, and we appreciate your referrals. What’s your native language, are you learning/ have you learned any other languages, and what’s your methodology? I enjoy reading this artical its very good but I have one q I am worker and I have 2 kides so I am very busy really I want to speak english as a native speaker could tell me how many hours I can improve my speaking and writing and listening from where I can start because there are a lot of english website all of them it’s excellent ? Thanks a lot for this website to help people and give our more and more . Hey Dareen, Sorry for the delayed response. I hope you English learning journey is going well! I would like to speak native english,how can I do it by myself? Hey Shelly, check out this article! It will help a lot. Take care! Indeed great post although seems to be an old one. Thanks for sharing your amazing strategy to reduce accent: decide to, doing it and being consistent about it. Hey Birgit, What do you mean? Make sure you subscribe, we have a lot of awesome material about pronunciation and connected speech! Actually, the sad thing is that, when there is attention to this matter, much emphasis is placed on pronunciation alone. This leads to disconnected speech and inability to really apply smooth, fluid, native-like style to communication. Did you know that the real key is much beneath the surface? Yep, it’s inside you. In order to get an accent and have success with its pronunciation (and be clear), you need to actually get into the character of a target language. That’s right. It’s part of what acculturation is (changing and adapting into its culture). Once we allow ourselves to ‘be’ – look, sound, move, act, react – like a target language, guess what? The accent and pronunciation moves so much easier and it sticks. Partly this is because you’ve emotionally connected in a positive way. Latest neuroscience shows us that when we begin with emotion on something, the body automatically starts to memorize this. There’s so much to say, but sufficient to say that when the body is in line with, or memorizing, the positive emotion, it sends signals and thoughts to the brain. Now, when you move your articulators (mouth, tongue, muscles, etc.) in a new and different way to sound more like the target language and culture: kaboom! You’ve got it and now you’ve got a basis for new accent, pronunciation and clear speech acquisition.